Flags related to the Civil War. The modern U.S. "Confederate Flag:"
After the Union Army invaded Missouri its government joined the Confederacy on Halloween of 1861. They ended up with two state governments for a while: the elected government, and a provisional government created by the Union who remained in the U.S. The Image is by Ariane Schmidt. 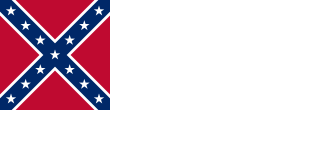 Second Confederate Flag, between 1863-MAY-01 and 1865-MAR-04. It was a.k.a. 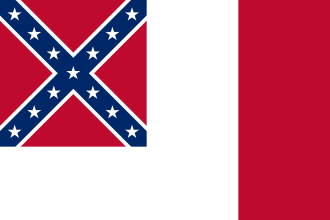 "The Stainless Banner", the "Jackson Flag", and the "White Man's Flag". It was designed by William Thompson (1812-1992). Image is by Fornax. Third Confederate Flag, between 1863-MAR-04 until the Confederacy disbanded. It was a.k.a. the the "Blood Stained Banner." It was designed by Arthur L. Rogers. Image is by Abjiklam. The Army of Northern Virginia's battle flag under General Robert E. Lee became the flag of the Confederate Navy in 1863. 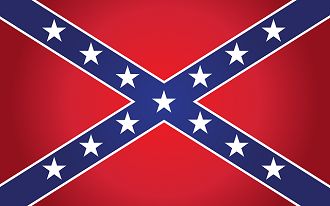 It has since become the modern-day "Confederate flag" even though it was a navy flag and never actually used to represent the Confederate States of America in any other way. It is now cherished by many Americans as symbolic of Southern culture, states 'rights, and historical commemoration. It is also treasured by many white supremacists and neo-nazis, and reviled by other Americans as symbolic of slavery, opposition to human rights, racism, race-based hatred, and lynching. Use of "Confederate Flag" is clearly now in transition in the U.S.
"Over the years, the Confederate battle flag has come to mean different things to different people in politics and pop culture. To many, it is emblematic of slavery, racism and the bloody battles that made the Civil War the deadliest conflict in U.S. history. But supporters of the flag say they see it as a memorial to slain Confederate soldiers." Some Southern states flew the Confederate Flag until recent years on their Capitol grounds. South Carolina was the last holdout; it flew there until the year 2015. It was removed after the mass murder of nine church members in a historic black church in Charleston by Dylann Roof, a white supremacist. "... every sector of the hate movement. ... When I came to Alabama, you would see these flags all over the place. And that has been less and less. You mostly see it now in the backwoods areas in Southern states or on Confederate memorials." It remains very popular among the Ku Klux Klan, neo-Nazi, and other white supremacist groups. "In recent years, the Confederate flag has become as much a news item as a Civil War relic. Intense public debates have erupted over Confederate flags flying atop state capitols, being incorporated into state flags, waving from dormitory windows, or adorning the T-shirts and jeans of public school children. To some, this piece of cloth is a symbol of white supremacy and enduring racial injustice; to others, it represents a rich Southern heritage and an essential link to a glorious past. Polarizing Americans, these "flag wars" reveal the profound -- and still unhealed -- schisms that have plagued the country since the Civil War. The Confederate Battle Flag is the first comprehensive history of this contested symbol. Transcending conventional partisanship, John Coski reveals the flag's origins as one of many banners unfurled on the battlefields of the Civil War. He shows how it emerged as the preeminent representation of the Confederacy and was transformed into a cultural icon from Reconstruction on, becoming an aggressively racist symbol only after World War II and during the Civil Rights movement. We gain unique insight into the fine line between the flag's use as a historical emblem and as an invocation of the Confederate nation and all it stood for. Pursuing the flag's conflicting meanings, Coski suggests how this provocative artifact, which has been viewed with pride, fear, anger, nostalgia, and disgust, might ultimately provide Americans with the common ground of a shared and complex history." * These are surprisingly high values considering the controversial nature of the flag. Did Slavery cause the U.S. Civil War? 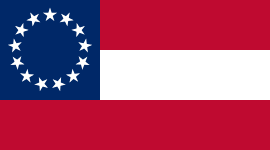 Flag of the Confederate States of America ...," Wikipedia, 2005 to 2013, at: https://en.wikipedia.org/ In the public domain. Image downloaded from Pixabay at: https://pixabay.com/ CC0 Creative Commons. Original image by "sinisamaric1" of Beocin, Serbia.